Our Balloons Birthday Mint Tins are so fun and festive! This totally FUN design can be personalized with 1 line of text. Our designers did a wonderful job creating this tin to be funky, fun and full of color! Each colorful balloon has text written on each one, stating, "Good times, Great Fun, Best Wishes!" Choose your favorite candy choice and mint tin color. Perfect for man or woman. 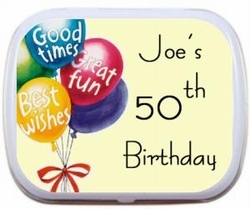 Personalized Mint Tins are a trendy Party Favor and wonderful keepsake that you can enjoy long after the party is over! Each personalized mint tin is designed with a hinged closure, topped with a personalized label and individually shrink wrapped around the edges of each mint tin. Each palm sized mint tin measures 2.25" x 1.75" x .5" (but are also available in the Altoid mint tin size which is 3.75" x 2.5" x .75").